Spartans’ guard Nic Thomas drives against Colorado in the Spartans’ last game of the season. Photo by Grey Gibbs from NSUSpartans.com, used with Athletic Dept. permission. The Norfolk State men’s basketball team ended their season with the second most victories since moving to D1 competition. The Spartans shined early, picking up a huge double overtime win over rival Hampton University. They powered through a midseason rough patch, losing 5 out of their last 6 games before new year’s. Under the steady hand of Coach Robert Jones, the Spartans went on to win 17 of their remaining 21 games, earning the regular season MEAC title for the first time since 2013. NSU headed into the MEAC tournament as the number 1 seed and had a target on their back, but the Spartans were ready, winning their first two games by a combined 11 points. A NCAA tournament bid was within reach before a tough loss against the NCCU Eagles in the MEAC tournament championship. They wouldn’t allow this to put a damper on their postseason aspirations, however, coming away with a huge upset win over #1 ranked Alabama in the National Invitational Tournament (NIT). Norfolk State was led by senior Derrick Jamerson Jr., who contributed 25 points and 7 rebounds in the win. This was the first postseason victory for the Spartans since the 2012 upset of #2 seed Missouri led by NBA player Kyle O’Quinn. 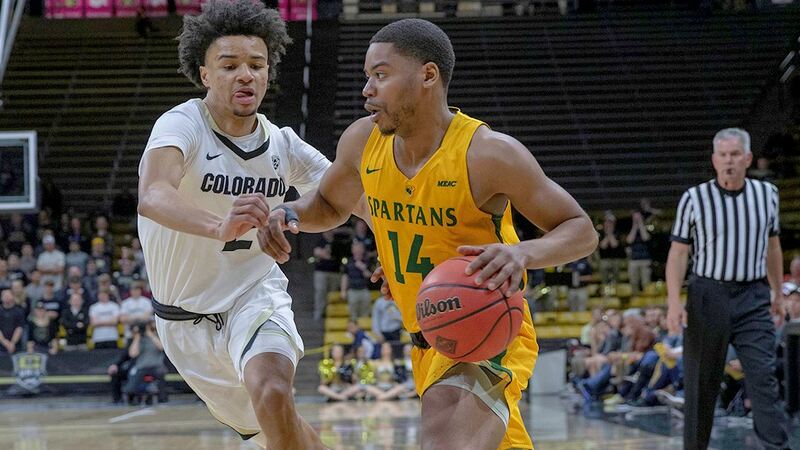 The Spartans advanced and traveled to Denver to play Colorado University. They lost a well-played game, 60-76, putting an end to their season. “This was a beyond amazing group that had a helluva year. Gave everything possible and will be forever remembered in history. Couldn’t have asked for a better group of guys to be with for my first year,” Assistant Coach Leonard Fairley said on Twitter after the game. After a successful season for the team, our Spartans earned a few noteworthy individual accolades to show for it. Derrick Jamerson has been a sniper from deep all season long, shooting an elite 51% from 3-point land. He was chosen by the National Association of Basketball Coaches (NABC) to be a member of the All-District team, the first Spartan to do so since Jonathan Wade. Coach Jones also took home some hardware this year, winning MEAC coach of the year and District 15 coach of the year, while also being a finalist for the Ben Jobe award. The future of Norfolk Sate looks bright, with 9 players returning from this year’s roster. Sophomore Mastadi Pitt and freshmen C.J. Kelly are primed to step into bigger roles next year and the team’s leader in points and assists, Juniors Nic Thomas and Steven Whitley, are eager to lead them. With an award-winning coach and plenty of talented players, Norfolk State is ready to compete for another MEAC title. Tags: basketball, MEAC, men's basketball, NIT, Norfolk State, NSU, recap, Season, Spartans, tournament. Bookmark the permalink.